Installing Bizagi Web parts for SharePoint can be carried out in two ways: through an installer which will guides the procedure, or by manually deploying the Web parts from a WSP file (Windows SharePoint file). For more information about this feature, refer to Bizagi Web parts for SharePoint. This article describes how to install or update Bizagi Web parts in a SharePoint server through either way. It is strongly recommended that a SharePoint administrator (having expertise on deploying solutions to web farms) carries out this installation, especially when choosing to install the add-on by deploying the WSP file. •Have your SharePoint configured by following the best practices enforced by the vendor (Microsoft). Keep in mind that within such best practices recommended by SharePoint, it is fundamental to install SharePoint under a domain (without using local accounts, which is not supported). For further detail about this, and to view the list of SharePoint's requirements, refer to their official page at http://technet.microsoft.com/en-us/library/cc262485%28v=office.15%29.aspx. 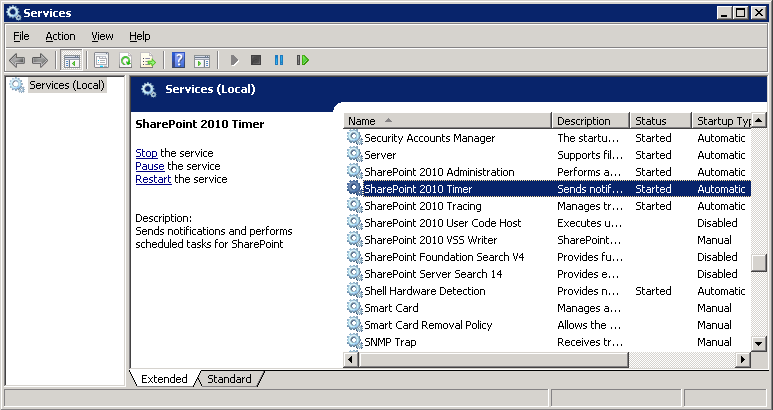 •Ensuring you have SharePoint Timer Services enabled, and in a started status. •Ensuring you have SharePoint Administrator Services enabled, and in a started status. Having a service account that has Web farm administrator rights. oHave administrator rights at the Bizagi Server. oHave execution permissions for Bizagi Work portal. oBe created as an user in Bizagi (especially to configure the process button web part). •Ensuring that your site collection is configured to use the same base URL of your web application. This URL must not specify any additional suffixes (e.g: http://[SharePoint_server]/[site]/). •Following all usual and regular recommendations, which are oriented towards hardware and software configuration and tuning in SharePoint. Refer to https://technet.microsoft.com/en-us/library/cc262485.aspx#hwforwebserver for official information. Consider that Microsoft encourages the use of a SharePoint 2013 Standard or Enterprise edition. Web Parts are supported in SharePoint 2010 or SharePoint 2013 installations. All editions are supported (Enterprise, Standard or Foundation). SharePoint installations must be set On-Premise. Bizagi Web parts are not shown within a responsive content. This means that these web parts will not be displayed in mobile devices or tablets. 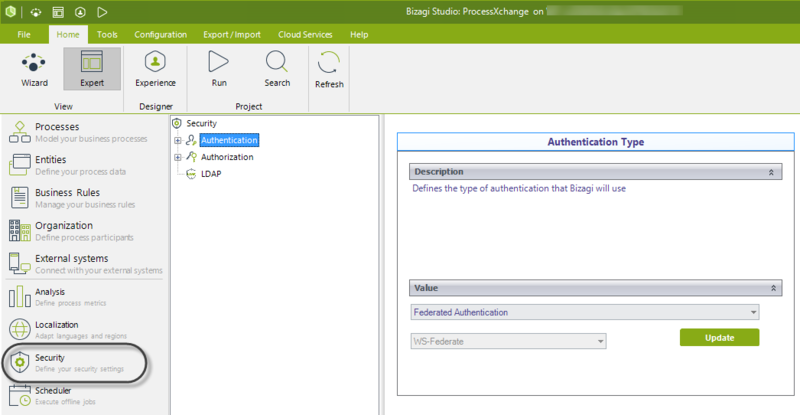 Keep in mind that this integration scheme relies on the Single Sign-On capabilities provided by an integrated type of authentication (both set in Bizagi and in SharePoint). For this, there are 2 alternatives that consider integrated authentication: Windows authentication or Federated authentication. Furthermore, Anonymous authentication needs to be disabled at the IIS for Bizagi Work portal. And, in SharePoint you would similarly use Windows authentication. And for this, in SharePoint you would similarly configure a Federated authentication against the same identity provider. Refer to the 2 alternatives presented in the sections below to either: install the Web parts from an executable installer, or to manually deploy a WSP file. Installing the Web parts will eventually restart your SharePoint Web applications. Therefore, make sure you schedule this step and execute it at non-working hours, and that you take the proper cautions. 1. Download Bizagi Web parts for SharePoint, as an add-on installer from Bizagi SharePoint resources. Make sure you choose the appropriate installer for your SharePoint version (2013 or 2010). 2. Unzip the downloaded file and run the installer's exe file for the Web parts add-on installation. A wizard will guide you through the installation process. The installer will recommend you to review the prerequisites and run a system check to make sure these are met. Once this is successful, click Next. The installer will validate if there is an existing installation of Bizagi Web parts. When installing for the very first time, no existing solution will be found and you may click Next. If you are updating to a newer Bizagi Web parts installation, you will be shown with the possibility to upgrade the installed version. Make sure you carefully read and accept the End-User license agreement. Notice you may also use the installer to uninstall Bizagi Web parts. Mark the SharePoint sites of your site collection and farm, so that you select those in which you will install Bizagi Web parts for SharePoint. Make sure you tick both the Bizagi.SharePoint.WebpartsConfig and Bizagi.SharePoint.Widgets items. Verify the installation preferences on the Summary shown. Click Next when you are done, in order to start with the installation. Once the installation has been completed, you may close the wizard. 1. Download from Bizagi SharePoint resources the Bizagi Web parts for SharePoint, as a zipped wsp file. Make sure you choose the appropriate one for your SharePoint version (2013 or 2010). 2. 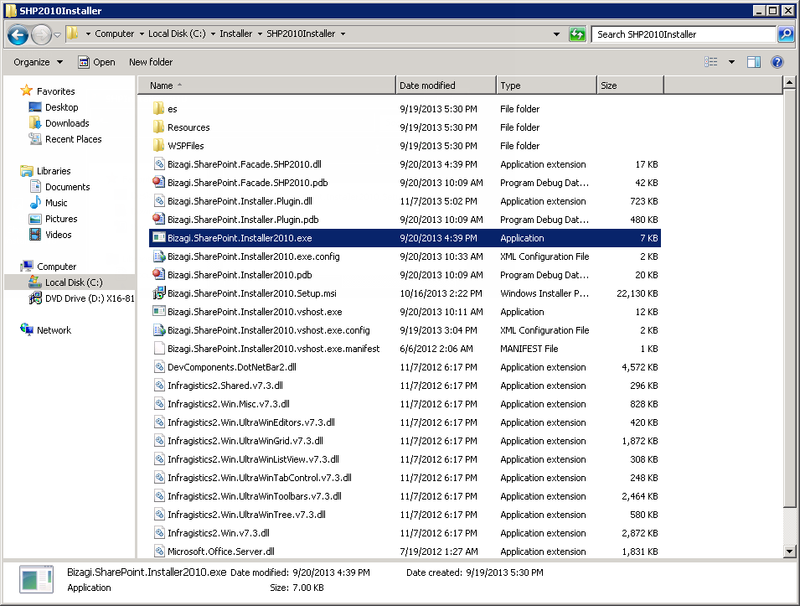 Unzip the downloaded file into a local path of one of your SharePoint WFE servers (recommended to use a server having central administration role). This local path will be referred to as <BIZAGI_WSP_PATH>. Notice this will uncompress these two WSP files. •For SharePoint 2013, these are: Bizagi.SharePoint2013.wsp and Bizagi.SHP2013.FieldPass.wsp. •For SharePoint 2010, these are: Bizagi.SharePoint.wsp, and Bizagi.SharePoint.FieldPass.wsp. Notice in this example, our <BIZAGI_WSP_PATH> is C:\Installer\WSP. 3. 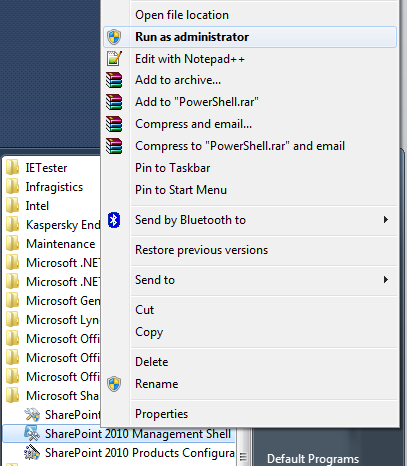 Run the SharePoint Management Shell. Make sure you run it as an administrator. This command and wsp installs a set of controls used mainly when configuring the Web parts connection to Bizagi. Note that before upgrading, you will need to backup the bizagi.custom.styles.css overrides file if you have included any customizations. 5. Run the SharePoint Central Administration. 6. Browse to the System settings section, to the Farm Management options, and into the Manage farm solutions option. 7. Deploy both WSP solutions. To do this, first click on bizagi.sharepoint.wsp. Then click on Deploy solution. Make sure you select the specific sites to which you want to include Bizagi Web parts. Once you click OK, take into account that the SharePoint Central Administration will restart the application pools of your SharePoint sites whenever this deployment is executed (meaning, it will temporarily disrupt the SharePoint site and its services). 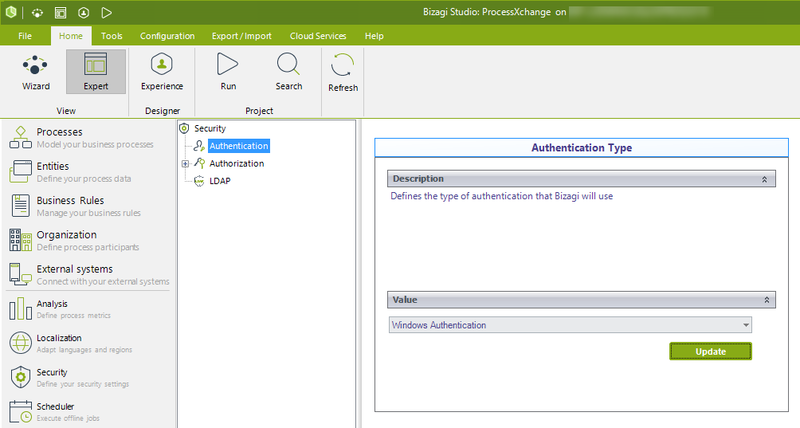 Then, make sure you repeat this step for bizagi.sharepoint.fieldpass.wsp. This means, click on it, and then on Deploy solution to run or schedule its deployment to the SharePoint sites. You may verify a successful Web parts installation by following the step described below. You may verify that Bizagi Web parts were successfully installed by accessing your SharePoint site through a browser. Make sure that the Bizagi Web parts components are active for your site collection. You should be able to see 2 Bizagi features installed and active: Bizagi.SharePoint.WebPartsConfig (used for the central Web parts configuration), and Bizagi.SharePoint.Widgets (containing the actual Bizagi Web parts). No actions are needed at these verification steps. You may only need to reactivate these (by using the Deactivate button and then the Activate button), to force a refresh of the Web parts, but that is only if: you have recently updated the WSP file and the newer file contains new Bizagi Web parts. At this point, we are done installing Bizagi Web parts for SharePoint and we have verified their successful installation! The next step is to configure the connection to your Bizagi Work portal, and then your SharePoint Web designer may include the Web parts into SharePoint pages. For more information about the next step, refer to Configuring Bizagi Web parts. If you are updating to a newer Bizagi Web parts installation or uninstalling the Web parts, run the installer as well.